Poor frito had to get his ears drained and stitched due to a Hematoma. :( Anybody have any experience with a Hematoma ears in dogs? Yup...Albus had them in both ears at about age 6. First one they did surgery on and stitched it. Second one they installed a drain that stayed in for a couple weeks. Both worked but his ears never stood up straight again. The vets (2 different ones) never could explain what caused it. The first one he had a very slight ear infection but the vet said it was nothing that should have caused him to shake his head enough to cause the hematoma. The second, about 6 months later, he didn't have any ear infection at all and nothing wrong with his ear. Poor Frito! 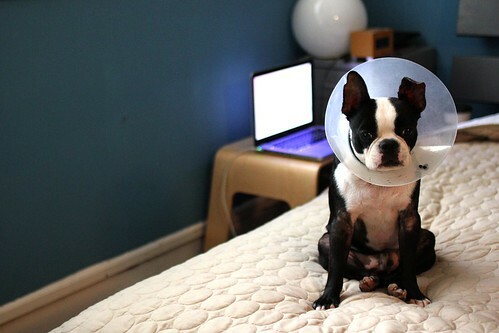 At least we can work the cone of shame look. I had a Saint Bernard that required draining and stitches. She was very prone to ear infections but only had the hematoma once. While I don't have any experience in the hematoma department, I just wanted to say your picture has an extreme 'DAWWWWWWWWWWWW' factor. Poor guy! awww - hope he is better soon!